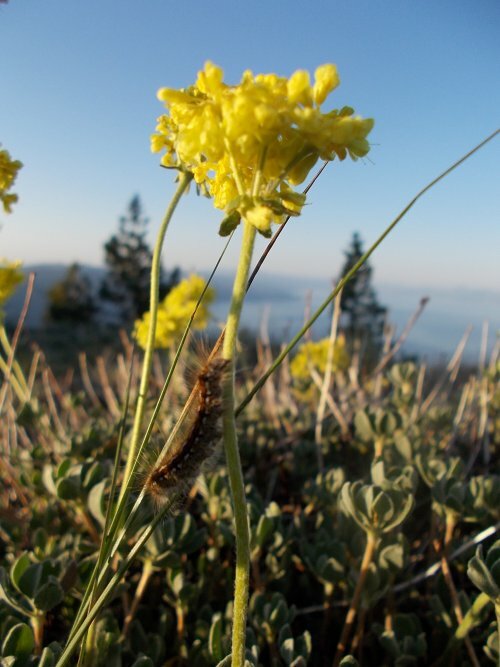 A caterpillar climbs this flower next to my campsite. Just before going to sleep, I looked over my maps for the trail ahead. The next water source, obviously, was of critical importance, but that looked to be about 10 miles away. Not a big deal. Especially early in the morning when the air was cooler. 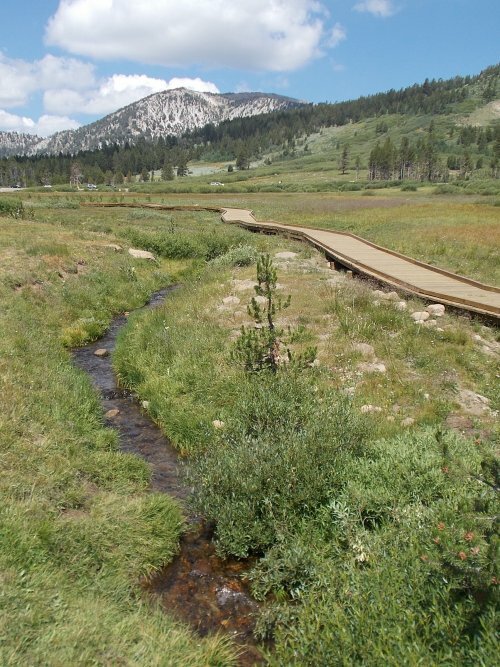 Then the trail would descend towards Tahoe Meadows where I should be able to find water directly on the trail. 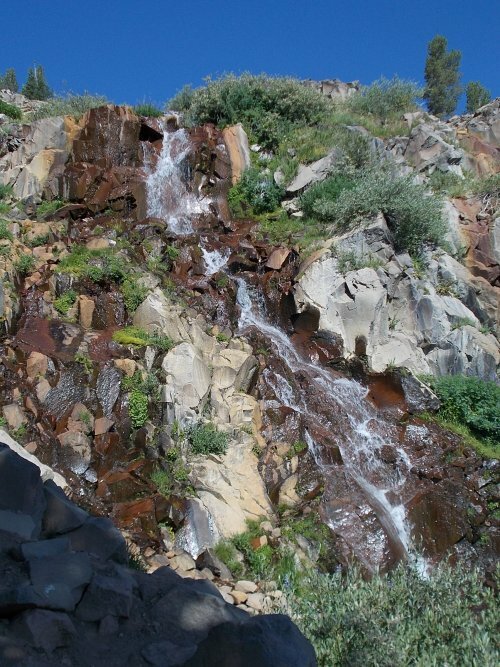 Water sources that don't require going off trail are always preferable to ones that require an off-trail hike. 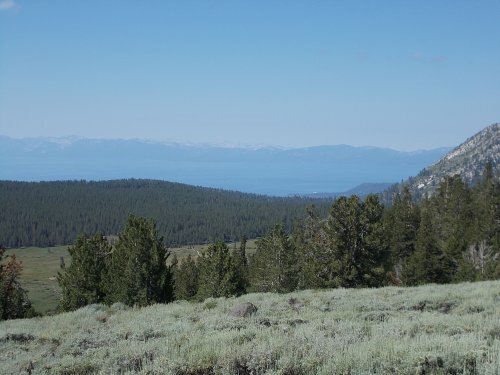 Then I'd enter Lake Tahoe Nevada State Park at which point I'd need to set up camp. Except the rules for camping are a little bit different than they are for most of the trail. 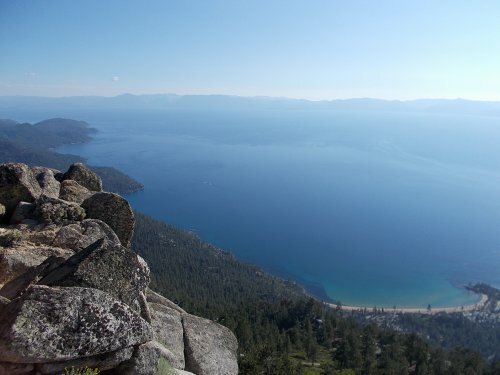 In Lake Tahoe Nevada State Park, backpackers are only allowed to camp in one of two different established backcountry campsites. Everywhere else is illegal. That limited my options considerably. So I looked at where the two campsites were. One required hiking about 1.5 miles off trail down a steep hillside. Yeah, I think not. 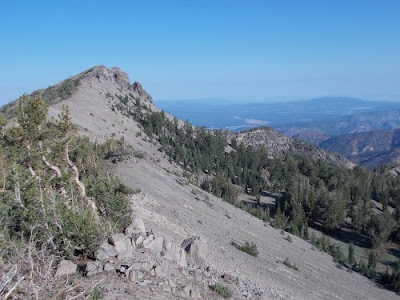 The other campground--the Marlette Peak campground--was on the Tahoe Rim Trail (yes! ), so clearly, that had to be my goal. So I started adding up the miles along my route to see how far away it was located and came up with something close to 24 miles. That had to be a mistake. Surely it wasn't that far away! So I added up the numbers again, but it still came out to 24 miles. Shoot! That was much longer than I had expected, and much longer than I wanted to do. But by this time, I had already set up camp, watched the sun set, and there wasn't really much I could do about it. Had I figured this out earlier, however, I totally would have done a few extra miles so I wouldn't have to reach to far this day. I'd be following my shortest day of hiking with my longest day of hiking! I could have definitely planned that out better. 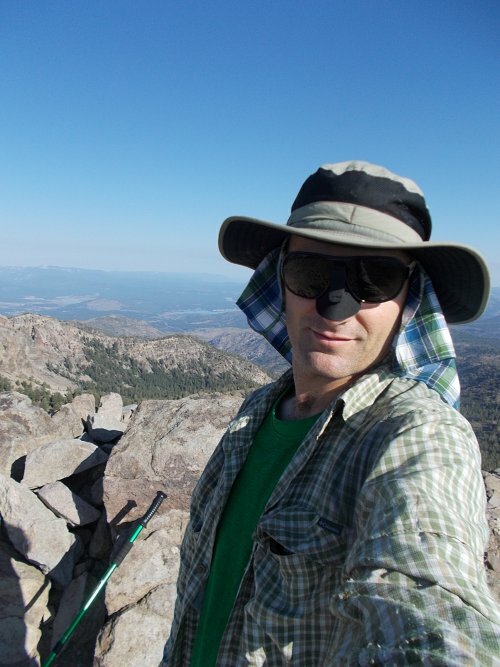 On the other hand, I did have a fantastic little campsite going on the ridge overlooking Lake Tahoe. =) And the sunrise was a stunner! It never did rain on me, and the clouds moved out overnight. The one unexpected problem, very minor, was that condensation had formed on everything during the night. It was the first night out that formed any condensation at all. So everything I had was slightly damp. Not a big problem, but a surprise since I hadn't been expecting it. I ate breakfast, brushed my teeth, packed up camp and headed out. First stop: the highest point of the TRT at Relay Peak. I found Recline and his dog camped in a field a mile or two ahead of me and asked him if he found Mud Lake. He wanted to get water from Mud Lake and avoid the trek down to Gray Lake to get water if he could help it, but I hadn't seen Mud Lake. Neither had he, apparently, and said he'd have to go down to Gray Lake as soon as he got up and moving. Bummer. Minutes later, I passed a couple of women day-hiking up towards Relay Peak. One of them asked if I was thru-hiking the TRT, and I said yes, then she said she's done it twice. The other girl hadn't thru-hiked the trail, but has done every bit of it as day hikes over the years. After them, I didn't see anyone else for quite a while. There are two routes to Relay Peak from the Mt. Rose Trailhead--a longer, windy trail, or a road. I suspect these people had arrived from the road. I could have taken the road down--both options were officially marked as the Tahoe Rim Trail, but I opted for the trail which I figured had less people, mountain bikes weren't allowed, and might be more scenic. I suspect I would have crossed paths with a lot more people had I followed the road down. Then the TRT reached a small stream that cascaded down into a waterfall. The stream and the waterfall weren't on my maps at all--a pleasant surprise! I replaced my water with it. There was nothing wrong with the water I still carried from Gray Lake, but this water was still ice cold which was refreshing. The water I carried had warmed to the ambient air temperature during the night and wasn't as cold and refreshing. The TRT intersected another trail which was labeled the Rim to Reno Trail. I felt a tug pulling me in that direction. In could just hike to the Reno airport! How awesome would that be? Except that I still needed to finish the TRT first. *sigh* I had heard of the Rim to Reno Trail, but I didn't really know much about it. Apparently, it's about 30 miles long, and I wasn't even sure if it had been completed. But I still needed to finish the TRT, so onward I trekked. At this point, the number of people coming up the trail multiplied like fruit flies. A couple here, a couple of more people there. Then a group of five people. Then a group of 10 people. I must have passed 50 people those last couple of miles before reaching the Mount Rose trailhead. Mount Relay, the highest point of the TRT. When I arrived at the trailhead, I wasn't sure where to go. 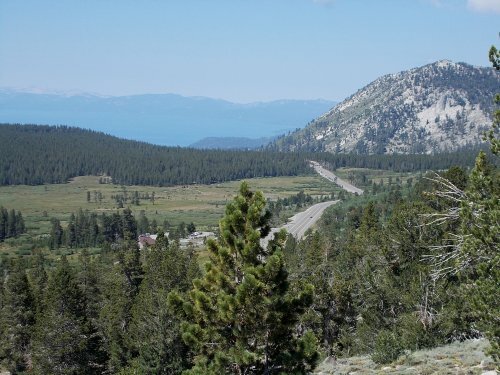 My map showed a thick, dashed line that marked the TRT, but it dead-ended at highway 431--the Mount Rose Highway. Then it restarted about half a mile down the highway at Tahoe Meadows. I wasn't sure exactly how the two ends were supposed to connect and the signage at the trailhead wasn't particularly helpful. I followed a connector trail to the dirt road (the same one that leads up to Mount Relay and is actually part of the TRT), then followed the dirt road to the highway. I could have walked the entire distance along the highway, but who wants to walk along a busy highway if you don't have to? Exactly. 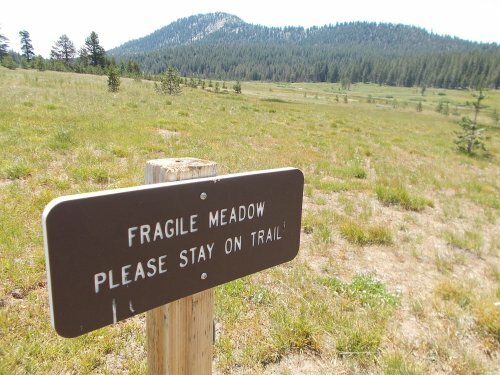 At that point, I would have to walk about a quarter mile on the shoulder of the highway--it didn't look like there was any way around that--until I reached the trailhead for Tahoe Meadow and was firmly back on the TRT. The trailhead was packed with people. Seemed like there were hundreds of them. (And it wasn't even a weekend!) I didn't stop to talk to any of them, though. I just pushed through to Ophir Creek where I filled up with water for the rest of the day. It would be my last known water source for the rest of the day, so I made good use of it. Then I took a short rest in the shade of the trees at the edge of the meadow. I'd already hiked 11 miles and it wasn't even noon yet. I was making good time, but I didn't want to burn myself out either. I still hadn't even reached my halfway point for the day! My hike continued. As I got further away from the trailhead, the number of people thinned considerably and I felt more in my element. interesting thing about this photo is that "nose thing"
The TRT has a few points along it where there's a side trail that goes off to a viewpoint, and I had decided that I would try to hit every one of them that I could. I didn't know when I'd be back, and if it was only a quarter-mile off the trail, why not? 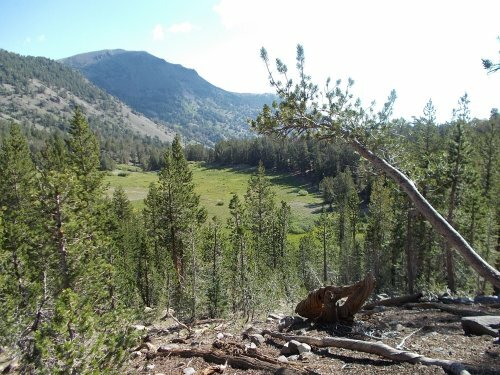 There was a viewpoint coming up, which looked like it went about a half-mile off the trail to a place my map called "Christopher's Loop." Normally, I would have done it, but today was already turning into my longest day on the trail of the entire hike at 24 miles. I'd have to skip it. I wasn't about to push myself another mile or two for another spectacular view. Frankly, they're all over the place, and I doubted this one was anymore special than all the others I'd seen. Then I read the highlights of this section on my map, which read, "Christopher's Loop (most photographed spot on the TRT)." That parenthetical note gave me pause. Really? The most photographed spot on the TRT? Yeah, sure.... I somehow doubted that a point half a mile off trail was going to be the most photographed point of the trail. And how would anyone ever know that? Who keeps track of how many pictures people take at every viewpoint along the trail? I just knew that if there was a most photographed spot on the TRT, it would be somewhere on the TRT and didn't require a detour off the trail. I was highly skeptical, but also curious why anyone would claim it was the most photographed place on the TRT. And the curiosity got the best of me. I turned on my iPod. At this point, I was already exhausted, and I needed a pick-me-up. So I popped in my iPod and started climbing the steep hill to Christopher's Loop, cursing that stupid parenthetical note the entire way. They call it Christopher's Loop, but it's more of a Christopher's Lollipop. The trail goes up about a half mile, then a small hooks up with a small loop that couldn't be more than 1/10th of a mile before returning back down the same way it came up. I reached the junction of the loop, decided to follow it counter-clockwise around, and minutes later came out to a viewpoint that made me gasp and my jaw drop. WOW!!!! I looked around. Oh, WOW!!!!! OH MY GOD!!!!! The view was too big to soak in. WOW!!!! This might very well be the most incredible view I'd ever seen in my entire life, and I've seen a lot of incredible views over the years. I dropped my pack and started taking pictures. I probably took a hundred pictures before I was done. It was certainly the most photographed point of my thru-hike! I tried self portraits. I tried panoramic photos. I tried multiple different exposure settings. In the camera screen, none of the photos seemed to capture the moment. Not even close. But that didn't stop me from trying. 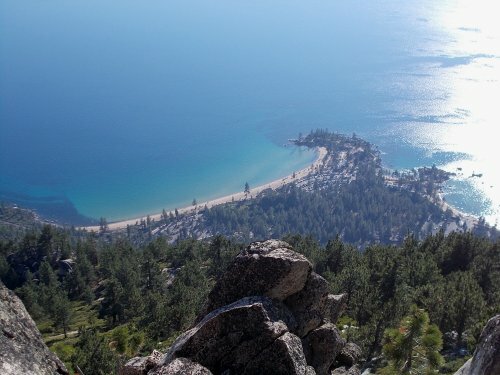 The viewpoint comes out to the edge of a steep cliff that overlooks Sand Harbor. 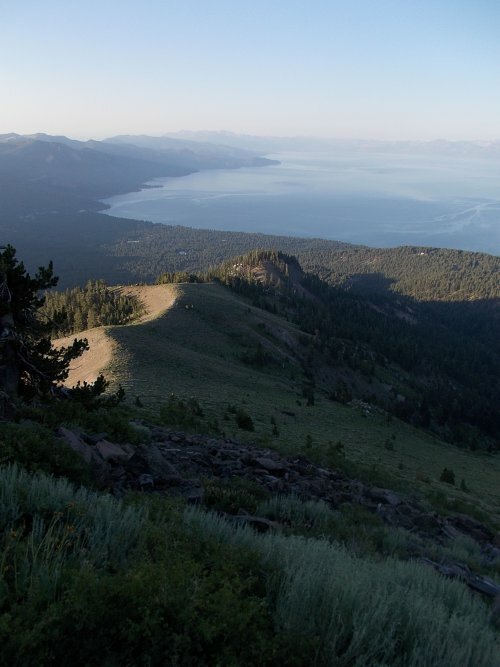 You can see the entire Lake Tahoe Basin, but you can see that from a lot of viewpoints. It's this cliff over Sand Harbor that brings a dramatic depth to the view that none of the other viewpoints had. It seemed like I could throw a rock and hit the cars parked along the shore. I could see the people with their umbrellas on the beach. The view seemed like it could have been from a helicopter, hovering over Sand Harbor. There are a lot of incredible views along the TRT, but this one was incredible and dramatic! And it hits you unexpectedly fast. A lot of views, you get a hint of what's coming. A peak through the trees here or there. This one is completely hidden until you walk right up onto it and it makes your head explode. I ended up spending about a half hour here, admiring the view and taking photos, so glad I didn't skip this particular side detour. All because I didn't believe that this could possibly be the most photographed point of the TRT. I admit it, I was wrong. Well, maybe I wasn't, but I can definitely believe that that viewpoint is the single-most photographed one from the TRT. I didn't really want to leave, but dusk was fast approaching and I still needed to reach the Marlette Peak campground before sunset. It was with great reluctance that I turned my back and headed back down the trail. 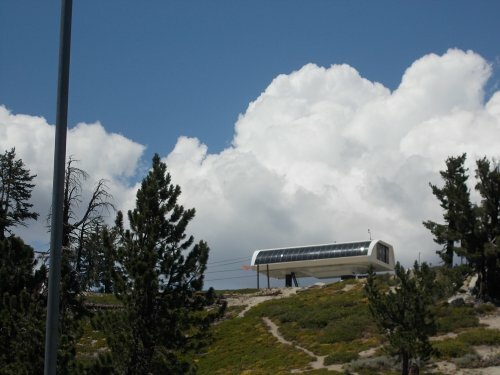 go over Mount Rose, so I won't be taking you up there. 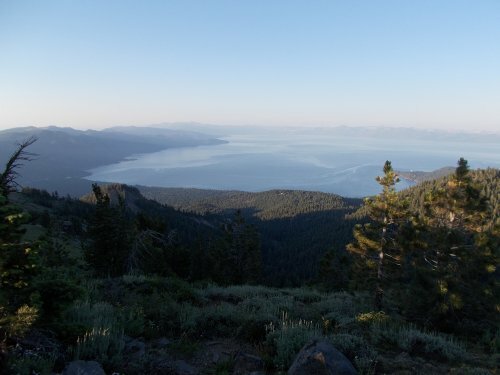 I did arrive at the Marlette Peak campground shorter before sunset. 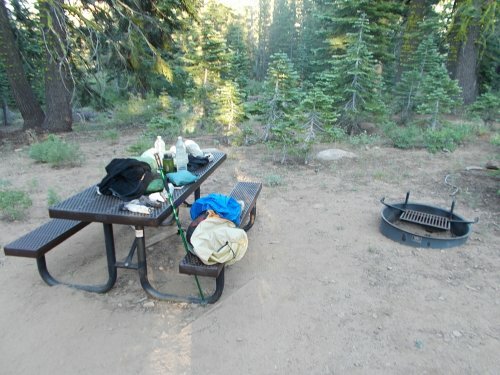 The campground was nicer than I expected with picnic tables, bear lockers and even grills at each site. (Posted notes, however, warned that fire restrictions meant that the grills could not currently be used.) 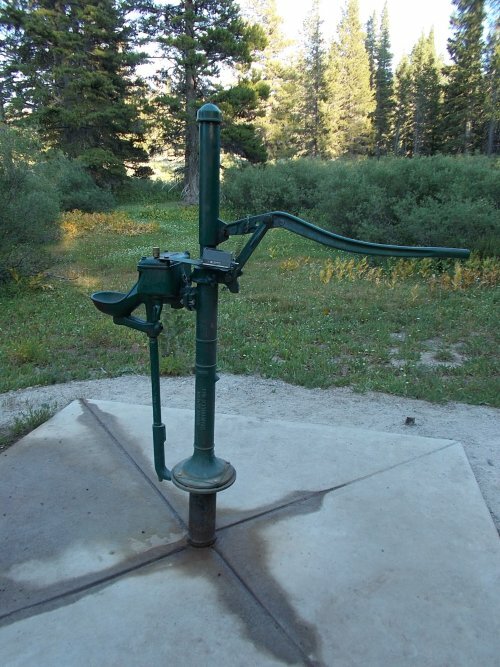 The campground had no surface water, so they also installed a water pump. I didn't want to mess with an unfamiliar pump in the dark, so that was the first thing I did--fill up with water. 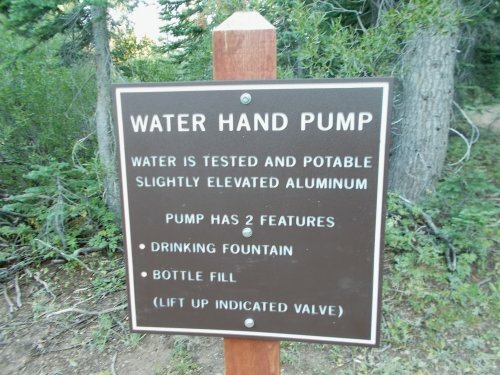 A sign by the pump said that the water had been tested and is safe for consumption, although it had "slightly elevated" levels of aluminum. Is that all? =) It took several pumps before the water started flowing--seems like most water pumps are like that--then I filled up my water bottles. 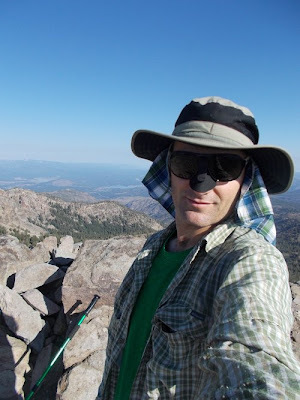 There were a few other hikers in some of the other campsites, but they largely ignored me so I largely ignored them. One woman camped across from me said hi, but she later talked on the phone then went into her tent so I didn't bother to get her story. Instead, I made dinner, brushed my teeth, then went to sleep. I was exhausted after hiking over 25 miles that day! 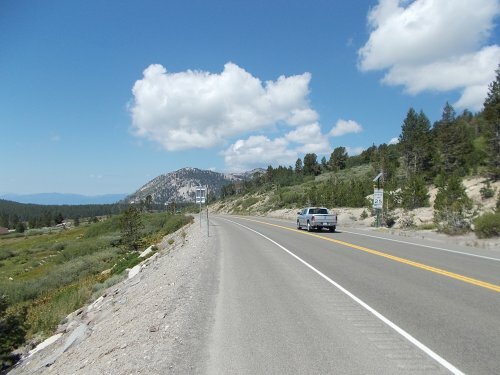 The Mount Rose Highway, passing by Tahoe Meadows. 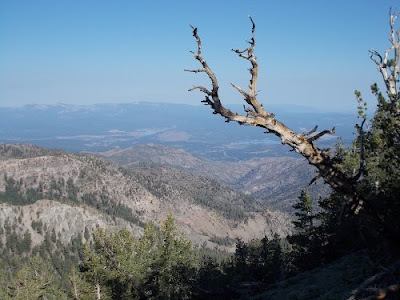 The Mount Rose Highway, and my short little road walk. until I reach camp at the end of the day. 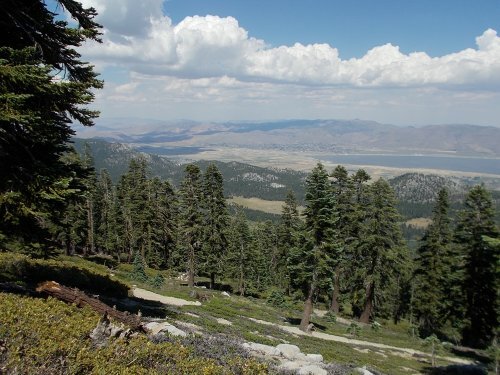 This section of trail also had incredible views eastwards over the Carson Valley. Washoe Lake State Park in Nevada. 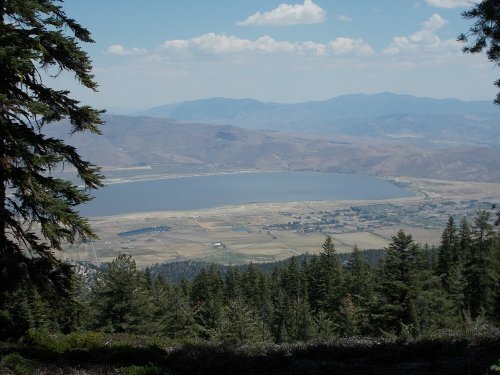 Another view towards Washoe Lake. Even this panoramic photo doesn't do the view justice. Everything looks so SMALL! Home, sweet, home at the Marlette Peak campground. Beautiful pictures again! Wow, is right!!! These photos make me wish I had taken up hiking instead of aircraft carriers when I was young enough to do it.